I hope you all was having great weekend! 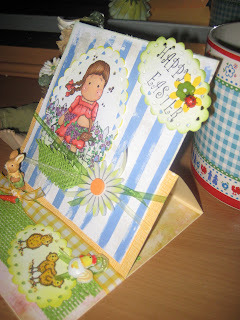 to make a card for Magnolia Down Under Challenge # 35 ~ Easter! That's my first Easel card, I just love doing it. I got the inspiration from Jodie from Oz. 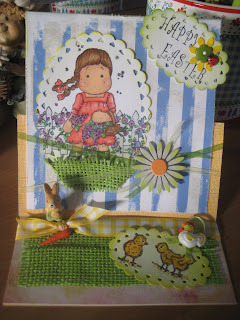 I love this Tilda .....:) I made few more cards with her, but for now I am posting only this one. The weather was so bad, that I can't make a good pic. of my cards. I hope you will enjoy my card. Just Magnolia Challenge~Week 43 sketch by Jay Jay! Hi everyone I hope you all have wonderful day! 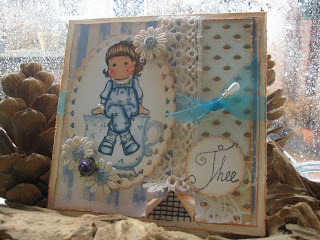 I made a card with Shabby look for Just Magnolia Challenge ~week 43 sketch by Jay Jay. it look also very shabby , lol.... but inspirat me to make this card. I coloured with Copics and disteressed the paper. Have a wonderful day eveyone! 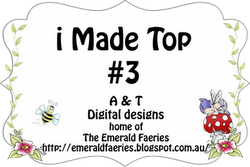 Friday Sketchers # 90 ~ Sponsored by InStyle Stamps !!! I have made a card for Friday Sketchers , that is my first entry for this challenge. 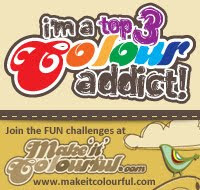 The image is coloured with Coloursoft. One card for two Challenges !!! 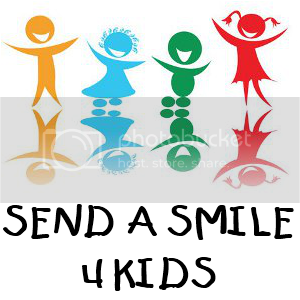 I love this image, remaind me when I was kid....and like so much to swing, lol. 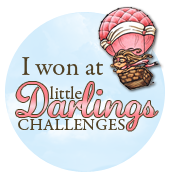 Challenge # 67 over at Whiff of Joy !!! I hope you all have wonderful weekend. Today I did few foto's, but the weather is not so sunny. That's why my foto will be a little bit dark (sorry). I use one of my favorite image , lol ... We all like to shop, yes.....:) ?! I coloured her with Copics. Paper pieced her shopping bags. The paper is from K&Company - Brenda Walton and also from my local Craft shop ( but I don't know the name of the company, sorry). The flowers and some of the embelishments I have bought from Cute Cards and Stamps. RED, WHITE/OFFWHITE, CHOCOLATE and PINK. I used an image of The City Girl stamps from Whiff of Joy. But this one is my favorite .... I think , lol. Isn't she pretty walking on the red carpet. I coloured her with Copic. 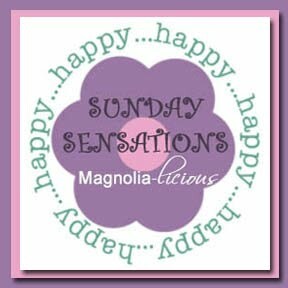 I hope you all have wonderful Sunday! The Tilda I have coloured yestarday for first time with Distress Inks. I decide to give it a try with Distress Inks. I want to say also thanks to Mina too, you can see her blog hier. From her blog I have got also inspiration to try Distress Inks. Copic Creations Callenge No. 21 ~ Feather Blending !!! I have made a card which i am posting for challenge over at Copic Creations Callenge. The Challenge is to use Feather Blending technique. So bear with me ...... that is my first card using this technique. Hier is my card, hope you enjoy it. The foto turn out little dark, but I hope you can still see it.